In the area of reptile breeding, vermiculite and perlite have already been used professionally for years. Vermiculite and perlite are very good brooding concentrates for the incubation of reptile eggs. Vermiculite and perlite are completely free of germs and therefore provide healthy breeding. They have a warmth insulating effect and transport the moisture away from the eggs while the air humidity stabilises at a high level. The substrate moisture significantly influences the development of reptile eggs. Especially soft shell eggs absorb a lot of moisture during incubation. The substrate moisture can be controlled using added water and the grain size. The fine grain substrate has a larger water potential and is closer to the eggs. It is recommended for small soft shell eggs. Coarser vermiculite improves the exchange of gas with more air-filled pores. It is recommended for large and hard shell eggs. Please pay attention: regularly replace vaporised water. Only incubate as many eggs per container that correspond with half the weight of the water. It is recommended that you don't allow the relative air humidity to fall below 70%, or 90% for soft shell eggs. Caution: dry vermiculite and perlite draw moisture therefore make sure that terrarium animals have enough water. The correct substrate moisture can be set relatively easily by mixing the substrate and water together in the same weight units. 1 part vermiculite and 1-2 parts water give a medium moisture level. The air humidity is kept constant and the eggs are given the opportunity to take the necessary amount of water from the environment substrate, therefore preventing the threat of mould developing. 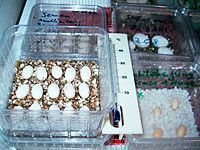 Vermiculite and perlite prevent eggs from becoming too wet, because too moist incubation near to the end of development can lead to the eggs dying off. With dosed water added, the substrate is set to the required moisture. The advantages result from the loose structure of the vermiculite, whereby clumping is prevented when digging the eggs into the soil as is the case with sandy substrates. Vermiculite offers the laid eggs protection and impact safety at a constant temperature.